The combination of eye fatigue and oxidative stress is considered by many specialists to be the main reason for increased rates of children developing myopia worldwide. In fact, a recent survey found that myopia rates in the US had grown in the last 30 years from 25% in to 42% . While another study found rates of myopia in Asian children can be as high as 90%! Eye fatigue (or eye strain) is caused by intense use of the eyes; reading, writing or using digital devices (like TV, smart phones or video games) can lead to eye fatigue . Common symptoms are irritated, sore or inflamed eyes with difficulty focusing and is frequently accompanied by pain and stiffness through the neck, back, shoulders, head and arms. Eyes suffering from eye fatigue are also at risk of oxidative damage from an accumulation of free radicals in the eye area. Free radicals oxidize (take electrons from) nearby cellular structures, disrupting their function and behavior. This can cause severe cell damage and long-term eye health problems. Every day children are exposed to different germs and bugs that can make them sick or unwell. Its estimated that children catch 6-8 colds per year while adults only catch 2-4. Children are more susceptible to these conditions because they have not built up the same resistances as adults and they spend a lot of time with other children, who may be sick, during school. Asthma is a common, but potentially dangerous, problem that affects breathing in many children. It is caused by over inflammation of airways in response to various stimuli such as pollution, tobacco smoke, dust and pets. This inflammation causes the airways to swell and narrow. Because it is possible for many things to irritate a child's airways, outside of using medicine, parents are limited in methods of asthma prevention. According to the American Lung Association, asthma affects 7.1 million children under the age of 18 and is one of the most common chronic disorders in childhood. It is the third leading cause of hospitalization among children under the age of 15, with an estimated 4.1 million children suffering from an attack or episode in 2011. With so many distraction available today (internet, social media, cartoons, cell phones and video games), it's tough for kids to keep focused. In a recent survey of children's teachers, 87% said new technologies were creating "an easily distracted generation with short attention spans". While another study found the average attention span for people had dropped in the last 10 years from 12 minutes to just 5! Lack of attention can make it difficult for kids to focus in the classroom and stick to the task at hand. Eventually, lack of focus may hurt children's grades and overall educational development. With the increasing trend towards consumption of highly processed 'convenience' foods and a decrease in physical activity, in favor of other activities like TV, the internet and computer games; obesity in young people is becoming a bigger concern. In fact, Obesity rates over the last 30 years in American children and adolescents have increased two and three fold respectively! Obesity can have both immediate and long term effects on children's health and well-being. Immediate effects can include: a higher risk of developing diabetes, bone and joint problems, sleeping troubles and poor self esteem. Longer term, obese children are more likely to be obese in adulthood which puts them at risk of serious health issues such as heart disease, stroke and type 2 diabetes. 'Healthy gut, healthy life' that is the theme that many specialists are promoting these days. Children's gut health can influences their well-being in a number of ways including: weight management, heart health, brain behavior and disease prevention. Unfortunately, factors such as food, stress, pollution, disease, medication, can negatively affect the gut lining integrity and the 100 trillion bacteria living there. This makes it hard for parents to be sure of their child's gut health. Relieve eye fatigue by improving blood flows. 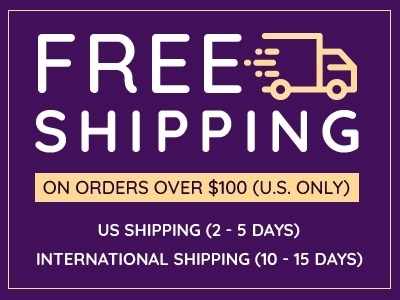 Provides antioxidant activity to combat free radicals in the eye area. Provide anti-microbial activity to help fight infectious bacteria and viruses. Helps enhance the body's natural defenses by boosting the immune system. Powerful anti-inflammatory properties help reduce airway inflammation. Potentially reducing the severity and frequency of asthma attacks. Demonstrated effects helping improve focus and cognitive function. May provide assistance to children with learning difficulties. Help fight harmful gut bacteria, promote the growth of 'good' gut bacteria. May improve the gut barrier lining improving resistance to allergens and pathogens. Required for proper functioning and development of human vision, the immune system, skin and general cellular activity. It also provides antioxidant strength to combat the effects of dangerous free radicals. Critical to the production of collagen, important for the bodies connective tissue and helping wounds heal. 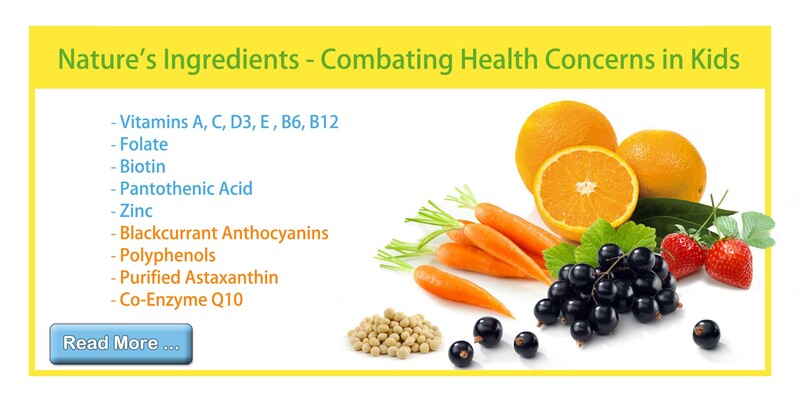 Vit C also helps the natural absorption of iron from plants, helps normal immune function and provides antioxidant protection against free radicals. Is important for helping bodies absorb calcium for bone development and health. Helps boostimmune defenses, widens blood vessals improving circulation and preventing blockages, helps the body's cells communicate with each other for important functions and has very strong anatioxidant capabilities. Is important for brain develoment during infantcy and play a role in regular immune function. It's also a key component within over 100 metabolic enzyme reactions. An important vitamin in maintaing nerve and blood cell health. It also plays a role in DNA synthesis for the body's cells. 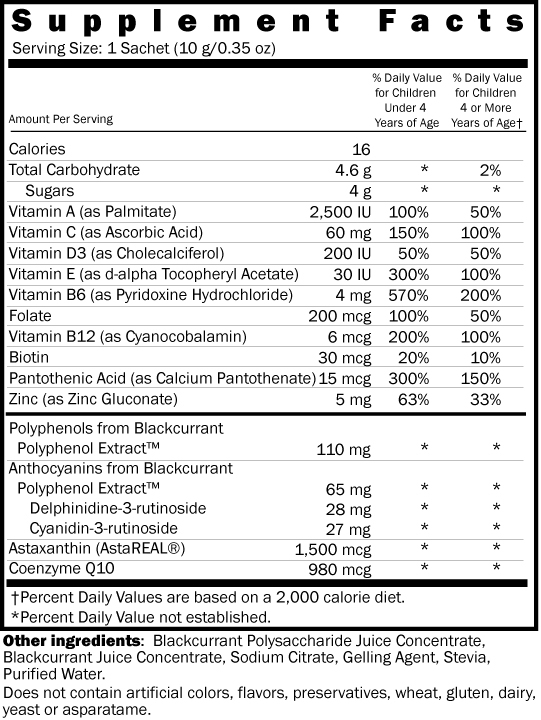 Is a B-vitamin (B7) that helps with energy production and maintaining blood sugar levels. It is important component of key enzymes responsible for breaking down fats, carbohydrates and other substances. Is a B-vitamin (B5) that helps with correct digestion. It also plays a critical role in the manufacture of red blood cells and, it helps the body correctly utilize other vitamins. A critical component in most cells throughout the body, zinc contributes to correct protein and DNA synthesis (critical in correct growth and development). In addition, zinc helps the immune system fight disease and can promote correct healing in wounds. What Does Vision Smart Center Do to Ensure the Quality of KIDS VisionSmart? Each 10g sachet provides a daily dosage of delicious, safe and active ingredients that help support the growth and development of children from as young as 4 through to teenagers. Unlike many other children's snacks and supplements, this tasty treat contains no artificial colors, flavors or preservatives. The unique and natural flavor of KIDS VisionSmart™ that kids love, comes from the premium quality Blackcurrants, exclusively sourced from the pristine New Zealand environment. 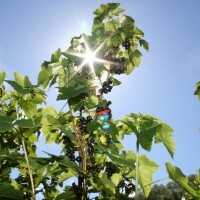 Advanced pesticide-free cultivation techniques in addition to the clean air, fertile land and fresh water found in New Zealand; make New Zealand blackcurrants used in KIDS VisionSmart™ unmatched in terms of quality, health content, safety and flavor. Careful growing procedures and quality control measures ensure KIDS VisionSmart™ has no contamination from heavy metals, pesticides or pollutants. 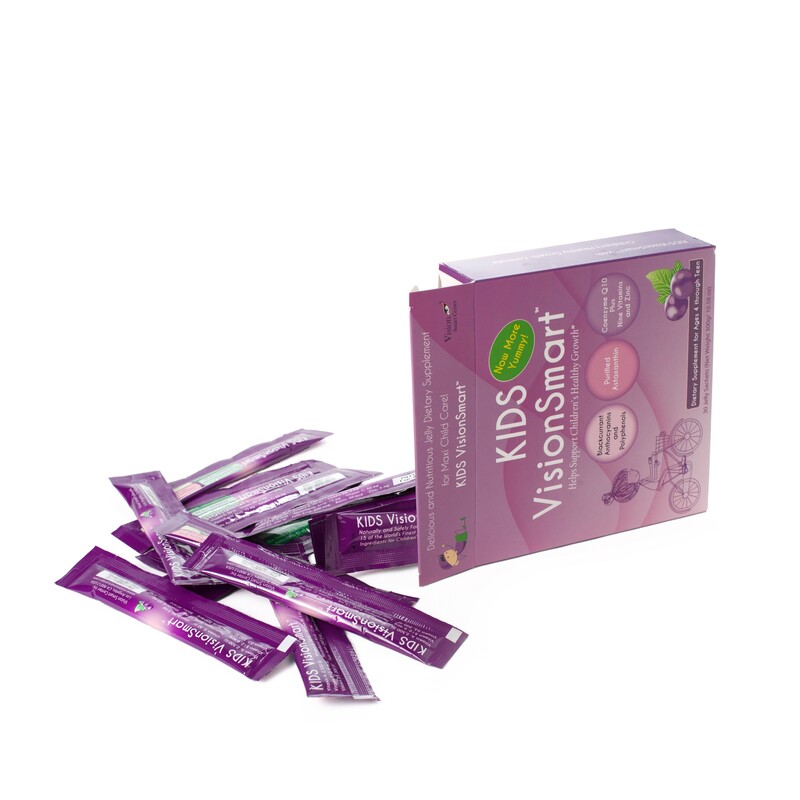 KIDS VisionSmart™ is also free from the common allergens: yeast, milk wheat and gluten. Each ingredient in KIDS VisionSmart™ has been critically reviewed to determine its safety and optimal dosage. All ingredients in KIDS VisionSmart™ have been sourced exclusively from top quality companies that provide only the best quality, pure materials without contamination from pollutants or heavy metals. With the exception of trace levels of soy, there are no detectable allergens in KIDS VisionSmart™. Finally, formulation and production of KIDS VisionSmart™ only takes place in GMP approved facilities that can meet the highest international standards for safe product production. Vision Smart Center is committed to producing high quality, innovative and active food supplements to help keep families healthy. Maintaining product safety is fundamental to this vision and the upmost priority. 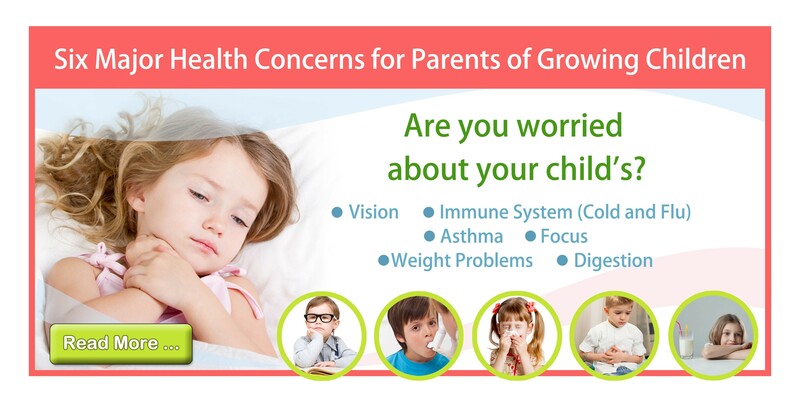 With these core values in mind, a comprehensive approach to the production of KIDS VisionSmart™ involving careful selection of suppliers, dosages, new technologies and manufacturing facilities, assures parents this product is safe for their kids. Just the Berries, one of the world’s most acclaimed blackcurrant specialists, carefully obtains the natural high levels of anthocyanins from premium New Zealand blackcurrants using a proprietary, solvent free extraction processes. 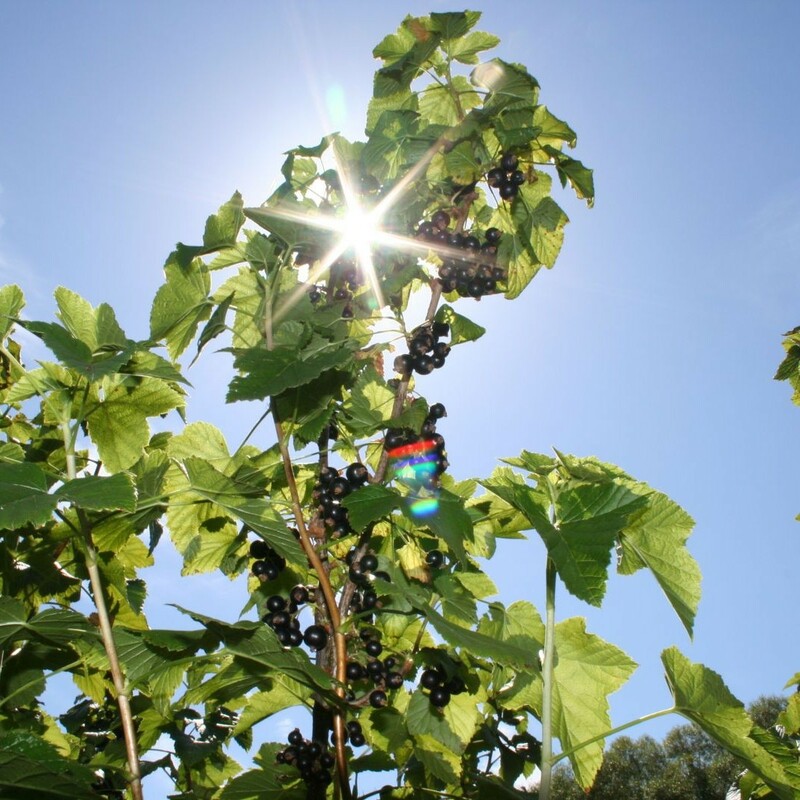 Blackcurrant seed oil is extracted sing a super critical C02 extraction method that preserves the natural health properties of GLA. These are then combined with other high health ingredients, obtained from top quality providers, to create KIDS VisionSmart. 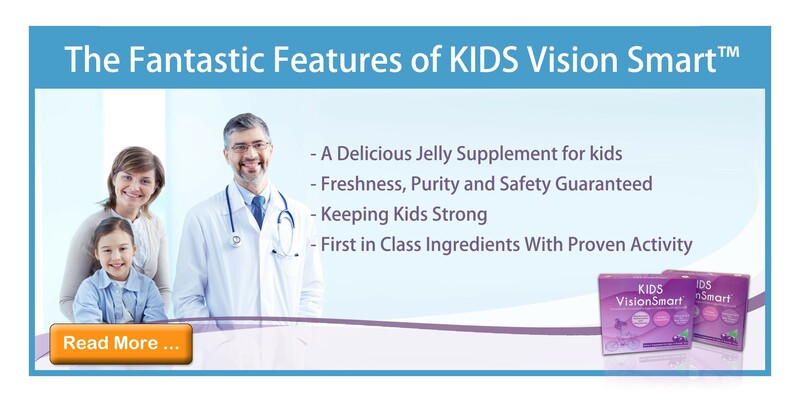 KIDS VisionSmart is manufactured, with proprietary Just the Berries solvent free extraction methods, using GMP approved facilities that meet the strictest international regulatory standards. This helps ensure highest possible product quality and safety. I bought it for my kids and I sometimes had it as well since it tastes great...Different from other pills/capsule supplements, it tastes like a blackcurrant jelly! I don\'t have to force my kids to get enough supplements any more. My kids love it and so do I!!! My 2 kids love the taste. I have never seen Jelly type supplement before. It\'s easy to carry and eat everywhere! Recommended use: Parents may give children one sachet per day as a dietary supplement or as recommended by a physician. Consult a physician before using this supplement if your child is taking blood thinning or anticipates surgery.